I can't believe it's been over a month since my last post! I hope you're all doing well, and I'll try not to go so long again without some kind of blog post. When I last posted I was getting ready for my final exams of the semester and preparing for my family to arrive for Thanksgiving. Well, I made it through my exams and survived another turkey day. I haven't been able to go fishing since the last time I posted, seems like every time I get the chance it rains and the streams flood their banks, I have done a few other fun things, though. My Dad and I have started a tradition of hiking the day after Thanksgiving, it helps to work off some of that big meal. This year we decided to hike the stairs at Tallulah Gorge State Park. The gorge reaches almost 1,000 feet deep, stretches close to two miles long, encompasses six separate waterfalls and is considered one of Georgia's Seven Natural Wonders. The state park has over 2,700 acres with more than 50 campsites, 63 acre lake with a beach, the Jane Hurt Yarn Interpretive Center and Museum and more than 20 miles of hiking and biking trails both around the gorge rim and leading down to the floor. Access to the gorge floor requires a free permit (available in the Interpretive Center, only 100 per day) and is occasionally closed due to high water from dam releases or rain. The day we were there the floor was closed. Dad and I opted to hike both rim trails and down the stairs to the gorge platform, the furthest into the gorge you can go without a permit. This works out to a bit over three miles and right around 1200 stairs. By working the trails into a loop this way you get multiple viewpoints of each of the waterfalls, awesome views of the Tallulah River in the gorge, the dam and remnants of the Great Wallenda's high wire tower. If you ever get the chance to go to Tallulah Falls, I highly recommend it. This area was a huge tourist attraction during the Victorian Era and it still holds a great deal of appeal today. We have the campground on the list to stay at in the spring so I'll be able to give more information about that then and staying there will give me an opportunity to fly fish the Tallulah River. I'll finish this post again with pictures, but you really should visit Tallulah Gorge in person to appreciate it's history and beauty. 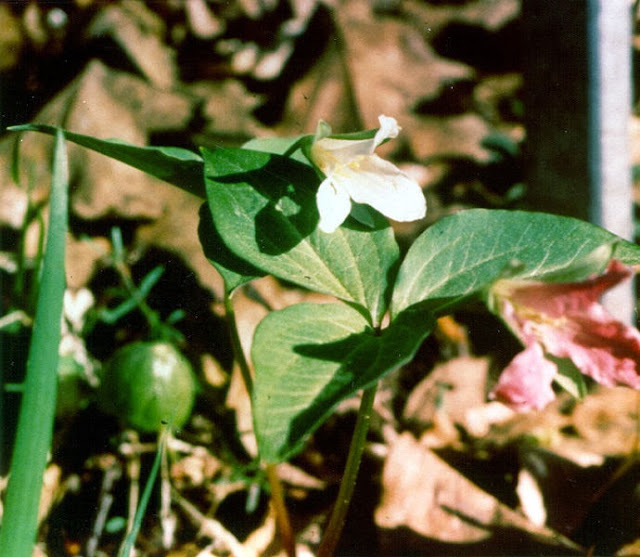 The Persistant Trillium. This rare flower is the reason for the limited floor permits. Photo from the US Army Corps of Engineers. The first look into the gorge. A view of the cliffs. The 80 foot suspension bridge coming into view. Dad checking out the cables. I think it'll hold both of us! The same view as earlier, but from the bridge. Looking down on the lowest platform and the gorge floor. The trail map, posted at the lowest platform. Hurricane Falls seen from the lowest platform. To hike the gorge floor you have to rock hop across the river here. Dad on the ascent from the floor. That's a lot of stairs! Looking down from the South Rim Trail. I should have recorded which water fall is in each picture. I'm still learning with every blog post! Another incredible view into the gorge. A view out over the gorge from the stone picnic shelter. The highway with the dam beyond. The rest of the water flow for the river comes from the hydroelectric spillway. What remains of the tower from the Great Walenda's high wire crossing of the gorge. The trail continues on straight here, but, as the sign says, a permit is required. A stunning view from inspiration point. Dad's sunglasses are down there somewhere!